In maintaining and managing industrial plants, monitoring waste water pH/ORP is both a legal obligation and an unavoidable necessity for protecting the environment. Monitoring without an attentive eye can lead to severe consequences. If toxic substances happen to leak externally, not only will legal sanctions result in plant shutdowns, but also the firm's image will suffer, and victims of pollution may require compensation. To avoid this, sites usually conduct patrols to take measurements of waste water. However, many do this remotely because it can be difficult to reach some of the measuring locations, and there is potential for human error such as when recording the measured values. 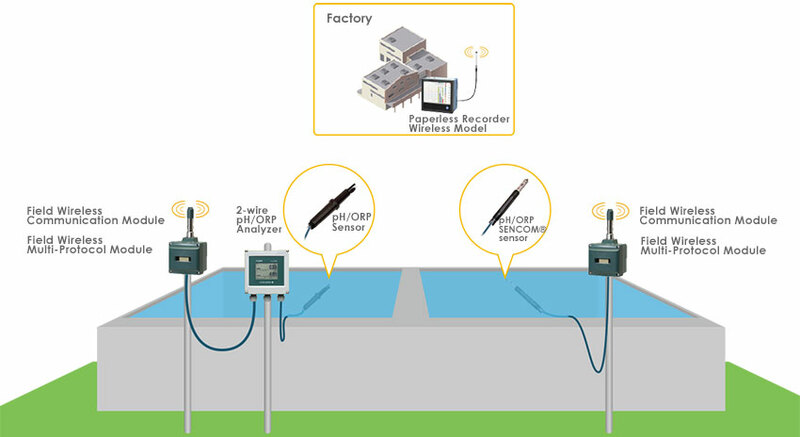 Using Yokogawa Electric's "Plant-Wide Field Wireless" as a pH/ORP monitoring solution enables centralized management and accurate wireless measurement at each point without an attendant. What is Plant-Wide Field Wireless? Plant-Wide Field Wireless is a wireless system that employs the international ISA100 Wireless (IEC62734) industrial standard, giving it the reliability demanded of industrial wireless communication and real-time functionality. It utilizes a redundant "Duocast" technology that communicates with two Access Points simultaneously to maintain connection when a communication channel or Access Point fails. It is highly scalable, supports a variety of interfaces for connecting to the Access Points and upstream systems including Ethernet, wireless LAN, and optical Ethernet, and is flexible during structural changes, making it ideal for building large-scale wireless networks. The minimum configuration for the pH/ORP meter is simply the pH/ORP SENCOM® detector series, the FN310 Field Wireless Multi-Protocol Module, and the FN110 Field Wireless Communication Module. With wireless communication, you can send data directly to Access Points. And because it is battery powered, no power supply is needed. The batteries last up to 10 years depending on operating conditions, and therefore almost no maintenance is required. You can easily and accurately measure in remote, difficult-to-reach drainage channels and outlets. The communication range is 500 meters, and you can monitor from a control room that is up to 2 km away by installing relays. You can install up to 500 measurement points, offering excellent scalability. Even in large-scale plants, you can centrally manage drainage measurements. Wired solutions require installation with cabling, which costs time and money. But with wireless, you simply install a device at each measurement and relay point, and this lowers the cost. Installing the system can take as little as a day, making it hassle-free. Acquired data is aggregated on an upstream system for output in control screens or as reports that you can customize for the needs of the site. If you require a more highly redundant system, we recommend the FLXA21, a modular 2-wire liquid analyzer that connects to two detectors. And for easy measurement within the plant, installing a GX20W wireless recorder lets you remotely monitor data directly from field wireless instruments. All-In-One pH and ORP digital SMART sensor that keeps the motto "Simple is best" while combing the sensor with built-in intelligence and direct digital communication.